WHATEVER I expected on my trip to New Zealand, it wasn’t a human Kiwi (my partner Dave) getting lost in the kiwi house at Auckland Zoo. It was pitch dark, which the nocturnal kiwi likes, but as we revolved through the glass doors I went to the left and, due to a reactolight specs malfunction, Dave spun off to the right. He was still going round in circles 10 minutes later. The funny part was (although Dave didn’t see it that way) at first he thought he was looking at a keeper tending kiwis in their enclosure, and watched for a while. It was only when he noticed that the keeper’s looks and movements bore an uncanny resemblance to his own that the light dawned. He had been staring at his own reflection! Well, he is from the South Island. Eventually, through the Stygian gloom, we did spot something rustling in the undergrowth that might have been a kiwi. But the Tasmanian Devils next door were far better value with their pink pointy ears and Dracula fangs. More elusive than kiwis or sunshine during our early summer visit to Aotearoa – Land of the Long White Cloud in Maori – was anywhere to indulge in my one Spanish vice: morning coffee and brandy. Ask for alcohol in any café and they look at you as if you’d just ordered crystal meth. We were based in Waiuku which boasts New Zealand’s oldest pub. With its clapboard front and hitching rail, it looked like Ian McShane’s place in Deadwood and I’d love to have burst through the saloon doors like Calamity Jane but it didn’t open until high noon. Nor do supermarkets in New Zealand sell spirits. You have to go to a liquor store and even I didn’t have the bottle to ask where I’d find one of those at nine o’clock on a Monday morning. Cigarettes are kept under lock and key in a cabinet and sold furtively, as if Prohibition was in force – at prohibitive prices. One packet costs the same as five in Gibraltar. Smokers will soon join kiwis on the endangered list as lighting up anywhere within Auckland city limits is to be outlawed – even on infamous Karangahape Road, where everything else is permitted. ‘K’ Road’, as the locals call it, is the red light and LGBT district where a rainbow crowd strut their flamboyant stuff. And I mean flamboyant. We saw one LGBT-er (not sure which) literally ‘lighting up’ in a dress made of fairy light bulbs. 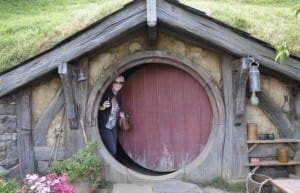 There’s lots to love about New Zealand, although there’s a reason it’s so green … And neither Frodo nor Bilbo Baggins were at home on our visit to Middle-earth. You can’t go beyond the door of the Hobbit holes, they’re just a ‘front’. But where in the world could you take off in a Cessna without filing a flight plan, land in a farmer’s field free of charge and grab lunch and a few Moa beers at a green lipped mussel farm in the middle of nowhere? Only in New Zealand where, outside the main towns, there’s just one human to one square km or large herd of sheep. But will I be emigrating? As I sit in my patio enjoying the winter sunshine – and a morning coffee and brandy porsupuesto – I think you know the answer to that one.